The purpose of the Deployment Research TWG is to provide insight into what further research, analysis, and planning studies are needed to be undertaken to guide the states and others as they proceed toward implementation. V2I issues identified by the coalition that relate to topics best addressed through research may be addressed by this TWG. 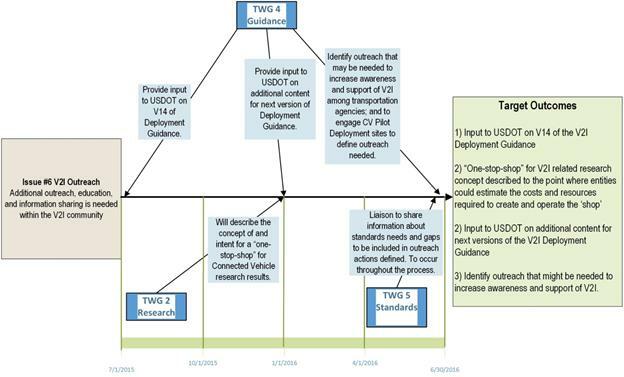 The Deployment Research TWG is intended to collaborate to identify and describe actions to be accomplished (either by the TWG or to be proposed for future work efforts). 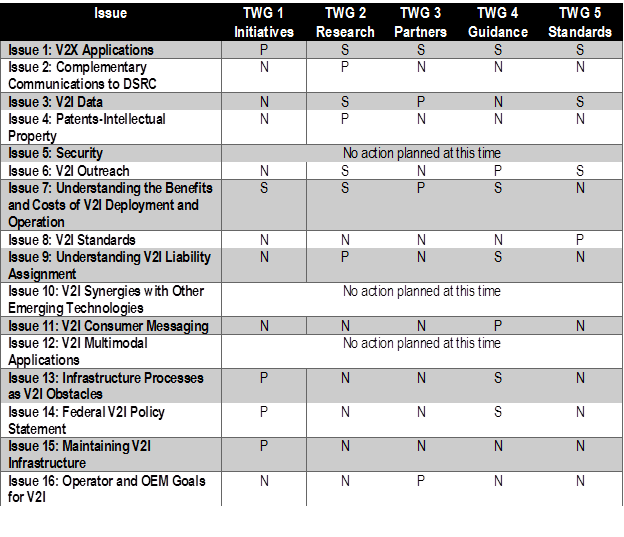 Out of the list of 16 issues, the TWG 2 Work Plan for June 2015 – June 2016 includes activities to contribute to seven issues surrounding V2I Deployments, which are indicated in the table below. However, TWG 2 decided to make the focus of their work plan the four issues that require collaboration with the other Technical Working Groups: Issue 1 (V2X Applications), Issue 3 (V2I Data), Issue 6 (V2I Outreach), and Issue 7 (Understanding the Benefits and Costs of V2I Deployment and Operation. TWG 2 members approved a Work Plan for the Technical Working Group as part of their monthly meetings. This Work Plan has been updated as additional information has become available describing the activities of other TWGs. 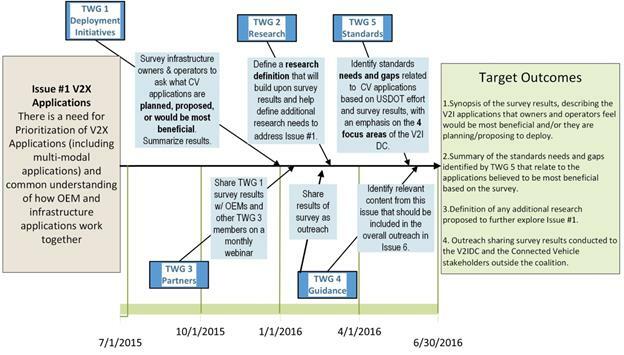 The fishbone diagrams below show how work from TWG2 will fit into the work being done by the other Technical Working Groups. TWG members have chosen to meet every other month by conference call or webinar. The following synthesis provides high level summaries of the webinars, and dates of future webinars that have not yet occurred. The August conference call was the first call of TWG 2 and the first meeting since the in-person meeting in Pittsburgh. A summary of the Pittsburgh breakout session was reviewed, as was the preliminary work plan for TWG 2. The group discussed specific actions related to the work plan and members of TWG 2 volunteered themselves to participate in the different actions. 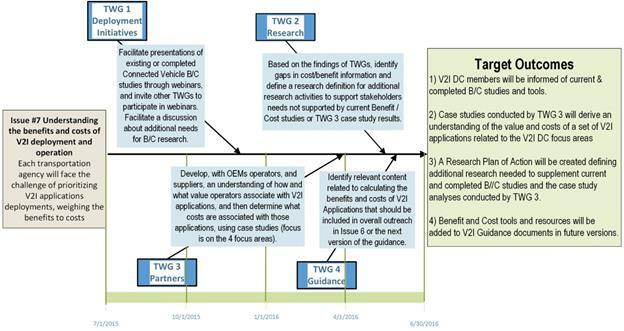 The National Operations Center of Excellence agreed to help the TWG 2 Chairs plan for a one-stop-shop for connected vehicle research results. The November conference call updated members on the results of the September V2I DC Executive Committee meeting in September, updated members on how this TWG will collaborate with other TWGs on certain issues, introduced members to a portal for information sharing, and gave members some preliminary information about the November 5, 2015, webinar for all V2I DC members. During this call it was decided that TWG 2 should put their focus on the four issues that require collaboration with other activities. Members volunteered to help with these activities.